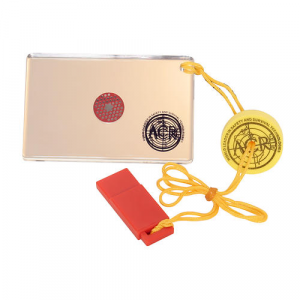 The Hot Shot Signal Mirror/Whistle Combo assures that you are seen and heard. The unique aiming device lets you be sure you're aiming the light beam at your target. 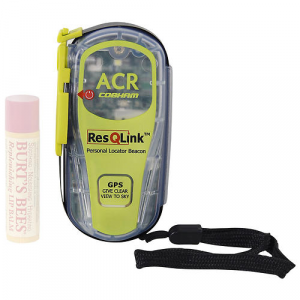 Essential signaling devices for open water and back country boating. Here's how it works (and the instructions are right there on the back of the mirror): 1. Hold the back of the mirror close to one eye. 2. Reflect sunlight into your hand. 3. When you look through the inner hole in the mirror a red spot will be visible. 4. Move the red spot to the target and that shows you where you are signaling. The red spot is an optical illusion created by the red reflective material that surrounds the inner hole in the mirror. The dual tone whistle gives a piercing blast of sound that can be heard over a long distance. It's attached to the mirror with a bright yellow lanyard. The attached float will save the unit if you drop it overboard.